If you're wondering who's behind RC Airplane World, let me tell you a little bit about myself. But before I do, let me first thank you for spending a bit of time on my site, and for being curious enough to want to read this About page! RC Airplane World was borne out of my passion for radio control flying and my desire to help folks find this exhilarating, diverse and, let's face it, addictive hobby. For the beginner rc pilot, this popular pastime can be overwhelming; "How do I start, what do I need, what's it gonna cost me??" are just some questions you might be asking yourself. Well, that's exactly why RC Airplane World exists - to give you, the rc newbie, the answers. To help you cut through the chaff, and to help you understand all the things you need to know - without bogging you down with all the stuff you don't! Online since 2003, RC Airplane World has helped thousands of tyro pilots find their feet when it comes to radio control flying. For me, creating the site has had its ups and downs, but when I receive emails that say things like "What an excellent and informative site - great tips, huge knowledge-base and succinct information, very well written and explained, and all done with a sense of humour. Your site does so much to put across the sense of both fun and skill in R/C flying!.. ", then I know it's all been worth the ride! That, incidentally, is a genuine testimonial, more of which you can see here. 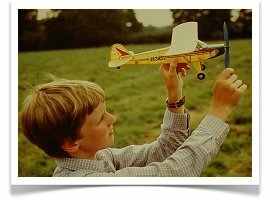 I was introduced to the hobby of aeromodelling at an early age by my dad, himself a longstanding aeromodeller; never radio control though, dad's always been strictly a free-flight fan. My parents' house backed on to a field which was perfect for flying rubber band powered planes built from kits. Many hours were spent in that field winding up these small balsa and tissue models, or sometimes experimenting with our own designs now and again. In fact, you can enjoy the short video to the right - some quality cine film from the early 1980s! I'm the skinny one on the left, with my brother. My plane in the film was a rubber powered Zugvögel, but the name of the manufacturer escapes me. It was plastic construction, I guess you'd class it as a rubber-powered RTF. In fact, that plane still exists today, nearly 30+ years on - good ol' solid German engineering! 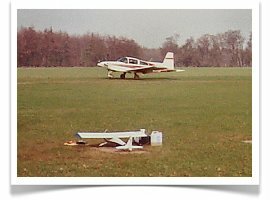 A very young me launching a rubber powered Super Cub, somewhen around 1980 I think in that same field. Nowadays, a model plane this size can be radio controlled - an impossible idea back then! 1984 at Old Warden in Bedfordshire, UK. 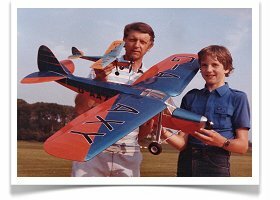 Myself and dad with 2 of his planes - a small rubber powered De Havilland DH80A 'Puss Moth' and a larger electric free-flight version. This photo actually made it on to the front cover of Aeromodeller magazine! 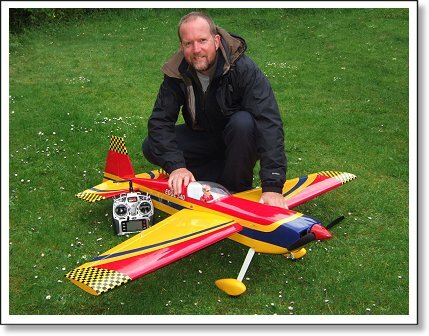 As the years passed it was inevitable that my interest grew to larger things - first with diesel powered free-flight planes and then on to radio control, with my first ever rc plane being a simple 2-channel glider (I'm still a big fan of rc gliders), then a 3-channel glow plug trainer and then on to bigger and faster 4+ channel planes. I soon joined a local rc flying club where I could fly more regularly and enjoy the company of like-minded modellers (reason enough to join a club!). My club's field was shared with full size aircraft too - obviously we were the ones who had to get out the way. The plane in the foreground was a Chris Foss WOT4, which sadly died when the ground interrupted my efforts to pull out from an over-ambitious spin. The plane was a '40' sport airplane, a Warrior by Barry Lever. Great fun and one of the few planes that I managed to keep in one piece. 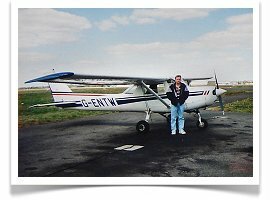 My progression through the hobby of flying finally hit the big time in 1998 when I achieved my Private Pilots License for single engine aircraft; an achievement that I'm very proud of. Sadly I've since had to hang up my headphones, but that's another story. I finally made it onto the 'big' stuff! "Tango Whiskey" was one of the Cessna 152s that I trained in and flew solo for the very first time. Here we're on the tarmac at Bournemouth Airport, pre-flight. My love of flying and planes has never diminished - I think that if you're introduced to it at an early age then it sticks with you for life. Kinda gets in the blood! And so, after discovering this thing called the internet, I decided to create a website - primarily to introduce people to this great pastime, but also to try and promote the hobby in general. I had never been a computer-lover, but I bought a small digital camera in about 2002 and this naturally got me using my computer on a regular basis. I slowly taught myself how to write basic computer code, and with the help of Sitesell & SBI!, RC Airplane World was created, and continues to evolve to keep up with the times. My efforts with the website are often rewarded with e-mails from visitors complimenting me on the nature and style of the site, and thanking me for the information available. It's very satisfying to know that I've helped others to get into this great hobby! And through the site, I've made contact with many interesting people from around the world and even had some invites to go flying in a few different countries. 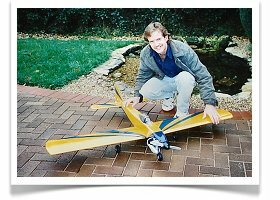 I'm not, and don't pretend to be, any kind of RC-expert but RC Airplane World is a very genuine resource for anyone looking to get started in the hobby of radio control flying, and I'm very happy to share what I do know. If you have found this site while surfing around for some information on the hobby, please do take a few minutes to browse the site - you might just find what you're looking for. Happy Landings to you all! Contact Pete / submit feedback. Read some nice words about the site.